For those following me on Twitter, this blog post will be an extended version of a tweet I posted last week. This blog post will explain a bit more about the situation, as that was a bit hard in a tweet of 140 characters. Also, this blog is a lot easier to find for future references. 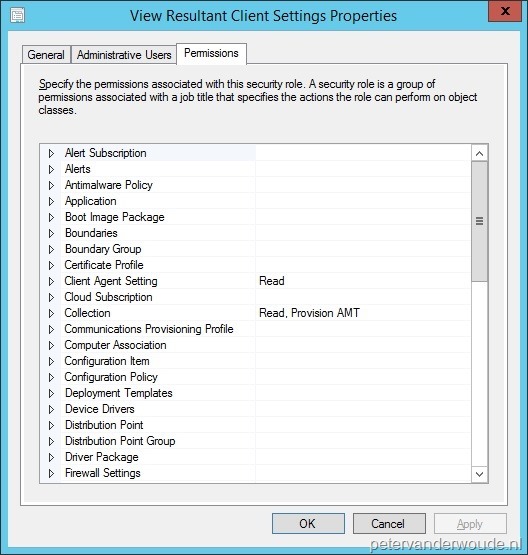 In this blog post I’ll explain what permissions are required to use the Resultant Client Settings feature that’s new since ConfigMgr 2012 R2. This feature can be used to view the calculated resultant client settings. This can be really useful when multiple client settings have been deployed to the same device, user, or user group, as the prioritization and combination of settings can be complex. Keep in mind that this calculation is done on the server-side. That means it will show the resultant client settings of how they should be according to the targeted policies. It doesn’t show the resultant client settings of the truly applied policies. That means that this can’t be used to see if policy are applied, or not. Without the read permissions the Resultant Client Settings feature will be grayed out. Without the read permissions the collections can’t be accessed and without the Provision AMT permissions the Resultant Client Settings feature will not show.